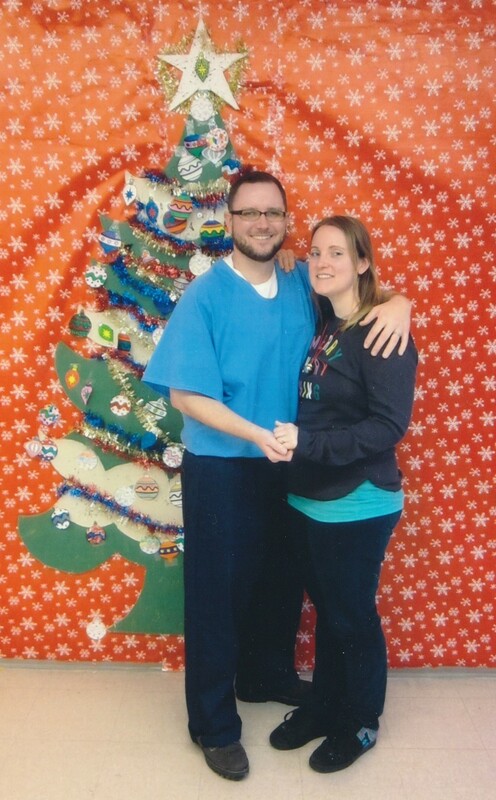 Christmas feels so different when one is spending it in prison. My Christmas Day went something like this: I woke up at 3:30 am to get on the road by 4 for my long drive to the prison, the last couple hours were spent navigating though fog. Not exactly the typical picture of a merry morning. There are no hats allowed in visiting, sadly that means no Santa hat however I did wear my old-school jingle bell necklace, which Sean enjoyed surprisingly quite a bit. We quickly hugged and kissed before sitting down at the table where we would spent the next 6 hours just holding hands and talking. The vending machine had no breakfast items available this time, but it did offer a few special holiday meals so our lunch was portions of sliced turkey, stuffing, mashed potatoes with gravy and cranberry. Sean piled this on the small rolls it came with for us; he smiled while eating. We felt grateful for a nice meal together. We reminisced about the time at Family Visit when we had gone out into the yard late at night to look at constellations together. We had found the Big Dipper, also known as the Great Bear. Sean had taught me how to locate Orion’s belt and now every time I get the chance to, I look up and am reminded of our time together. We both love the night sky, the stars and moon. I drove home from the warm south into the cold northern darkness. Arriving hungry and overtired from a non-stop trip back, I pulled into the Carl’s Jr. fast food restaurant parking lot. I walked wobbly legged, bare feet shoved into shoes, jacket askew, grateful to arrive safely and that it was open on Christmas evening. I felt surprised to see other customers inside; who is here and what is their story? I wondered. I went home to walk our tiny dog because he had been waiting for me to come home all day. I walked past houses decorated and brightly lit. Real Christmas trees shone through windows on my street. What are we missing out on? How many more holidays will be spent in prison? Sean has had 15 years of it so far, still waiting for the magistrate to make a ruling is beyond ridiclious at this point. But the pieces fit and feel just right even without all the things that so many associate with the holiday. Then I look up and Orion’s Belt is right there, big and startlingly low on the horizon like I’ve never seen it before- like a huge sign from Santa, God, the universe or whatever you, dear reader, believe it to be. It took my breath away and brought peace to my heart. This entry was posted in life in prison, marriage and tagged Christmas, marriage, Orion's Belt, prison, stars. Bookmark the permalink.